Japanese banks are mostly just like banks in other countries. But there are a few things to know. For short-term studies (that is, less than 6 months), students may not need to open a bank account. But for any stay of 6 months or more, it is necessary to open a bank account in Japan. It makes life much easier. And it is not so difficult to do anyway. 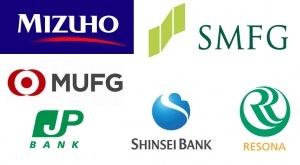 There is a large choice of banks to choose from – from the governmental institutions (Japan Post bank is widely used) to the “Megabanks” (Bank of Tokyo Mitsubishi UFJ, Sumitomo, Mizuho …) or simply local, regional banks (for exemple Chiba Bank in the Prefecture of Chiba near Tokyo). It is also worth noting that the main commercial banks from all over the world have branches in Japan (for example Deutsche Bank, BNP Paribas, HSBC, UBS AG, Barclays, Crédit Suisse, Bank of America …). As conditions applied by banks are quite comparable, usually students choose the bank that is nearest to their place, or to their school. This is really the main criteria. Banks in Japan are ran very much like other banks. They are most often open from 9am to 3pm, after which only the ATMs remain accessible (in many cases 24 hours a day), and they are closed on weekends. To open an account in Japanese banks, you just need to hold a residence card and fill a form. These are the only requirements – there is no minimum fee to be deposited. Note that some banks may ask your stamp (Hanko, i.e. personal seal), by way of signature. You may also be asked to write your name in Katakana. Practice before you go to the bank, or ask help from a teacher or a friend! You can have your hanko made in a hanko shop, for less than 1,500 Yens. In department stores, you may also find machines that make hankos. The same day you apply, you get your banknote, which enables you to make deposits at an ATM. Note that the banknotes does not always allow you to draw cash nor to make a bank transfer. For those operations, you will need your ATM card which you will receive by registered mail a few days later. As aforementioned, it is possible to find ATMs that are open 24 hours a day. ATMs in Japan operate the same way as anywhere else: users can draw money, make deposits (in cash), make transfers and update their bankbook. To access the ATM, one needs its cash card or banknote. 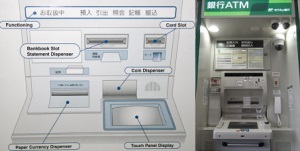 Important: in most Japanese banks ATMs foreign cards do not work. In order to use such a card, you would have to go to the branch of a foreign bank such as Citibank. But that would be possible only on big cities. Nowadays, you may find ATMs in shop galeries or “depato” (department stores) that will accept your card. Try different spots. For foreigners in Japan, it may be difficult to get a credit card. Banks conditions are quite severe so unless you are married to a Japanese national or have permanent residence, your request will likely be rejected. In Japan, people often use bank transfers to make payments – even to pay bills. The sender is charged around 250 Yens for each transaction, regardless of the amount transferred. 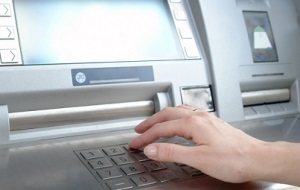 The easiest way to make a transfer is at the ATM (they can also be made on the internet or at the teller). Almost every bank provides English menus to ATM users (and sometimes Korean, Portuguese …). But if you cannot read Kanji, you may encounter difficulties to pick the right bank and branch of the addressee. No worry: make sure you go to the bank during opening hours and a bank employee (a receptionist or even a security guard) will assist you. The transfer is processed very quickly: if made before around 2pm, the address will receive it the same day. Very convenient. Although domestic transfers are quite straightforward, international wires are another story. Not only are they costly but they require filing out forms. Go to a teller and ask for more information. 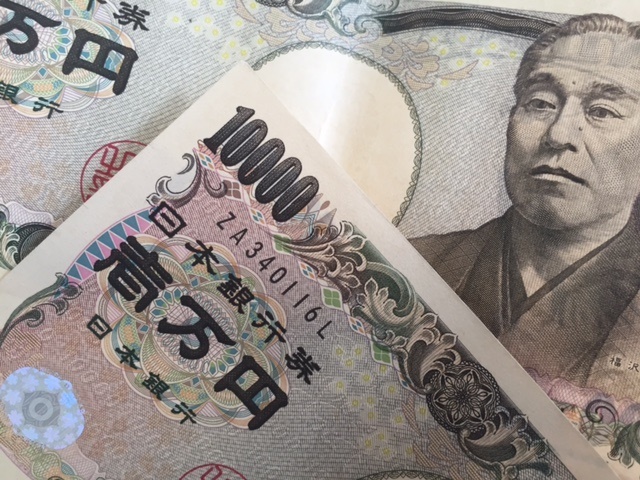 Japanese Banks can exchange foreign currencies. The rates are reasonable. To avoid making monthly payments (for example for utility bills such as electricity, water, gas), you can arrange the money to be withdrawn from your account on a regular basis. You just need to fill out a form for each supplier. They are extremely low, most often tenth of a point. Simply go to your bank with your banknote, your ATM card and your residence card. If your stamp was required to open the account, remember to bring it to close it as well.